it's a strange dichotomy that a frame caked in mud is a badge of honour for those concerned with the offroad world - though i'm not so sure about cross riders - while italian carbon fibre should gleam at every opportunity, no matter the prevailing weather at the time. i had thought the latter state would be a cinch during an extended period of sunshine and windlessness; no mud, and no puddles on the roads, should bestow shininess from morning till night. and with roadracer mudguards front and back, any stray smudginess should be dealt a glancing blow at source, leaving the colnago as polished on return to the bikeshed as on exit. well of course, i was wrong. where does all that dust come from? and why does it find it necessary to to adhere to the clearcoat? doubtless those questions were answered on the two days i missed during higher physics, but the dust remains, and in order to satisfy that finely judged degree of self respect that no roadie would be without, it has to be cleaned off. post tour stage or one day classic, the team mechanics would be out with the park tool workstand, the hose, and the no home should be without bucket and sponge. and yes, soap and water can achieve a great deal on a bike with method and application born of a seasoned daily routine. but that is a part of what team mechanics are employed to do, even if they would put up a convincing argument to the contrary. you and i, on the other hand, have a myriad of other chores that await, unless the better half has gone shopping for the weekend. or david and sean are presenting the vuelta in fewer minutes than could be reasonably considered ideal. so a modicum of assistance is required. it's at this point that a large cardboard box of muc-off sprays, brushes and lubes could come in handy. and in this case, that's exactly what is sitting on the bike shed floor. drop the wheels out, grab a water bottle of, surprisingly, water, and squish it across the bike's tubing, paying particular attention to areas of coagulated muck. this would be the normal occasion on which to liberally apply soapy bubbles in huge quantities, but in this case i applied a fine mist of muc-off pink stuff in a big bottle. leaving muc-off bike cleaner to soak in for a few minutes results in substantially less welly required when the time comes to clean the muck off. in fact, for relatively light coatings of grime, it was possible to remove lots by showering the the bike with another layer of water from that ever-so-useful water bottle. i liked this. of course, the problem with cleaning one part of anything is that it leaves any surrounding areas looking worse than they did before; in this case, i'm referring to the chain. it is a fact of cycling life that no matter which dry lube you prefer to use, the outer plates of the chain always lose their shine and display a similar propensity to that of the tubing for attracting stuff that you'd rather it didn't. this is where you can feel secure in the knowledge that the people at muc-off ride bikes too, because one of the cans sitting in that cardboard box is a degreaser, dedicated for use on cassettes and chains. in a similar way to the pink stuff, the degreaser is sprayed onto the chain (in this case), left for a modest length of time before more of that water is required. i didn't quite believe this bit, because i really didn't think that squirting water on an oilyish chain would clean it close to that of jewellery shine. it simply remains to wipe the chain with one of those bits of cloth that can always be found in sheds and garages, and if you had a face small enough, it could be clearly seen in each link. now, if you have been paying a reasonable degree of attention, you will hopefully have realised that all this water, pink stuff and degreasing aerosol is likely to have left the chain, at very least, bereft of suitable lubrication. the bike riders at muc-off at this point, are one step ahead of you: a bottle of dry lube. the instructions in excruciatingly small print on the label, advise that degreasing should be carried out prior to lubing - which is just as well because that's pretty much what the past ten minutes have been all about. after shaking the bottle vigorously, the method of application is to drip a spot of dry lube on each link. many cyclists swear by cans of spray-on lubricant, but the argument against this style of application is that of waste: unless you fit one of those plastic straws to the nozzle and direct the spray to just where it's meant to go, an aerosol tends to become multi-directional, especially out of doors in a stiff breeze. therefore the application to each individual link from a small bottle really ought to be a superior method - only in this case, that turns out not to be the case. the white liquid in the bottle is very much a liquid, expressing from the nozzle in quantities far in excess of that required. i tried to be very, very careful and specific as i lubed the colnago's chain, but no matter the method or angle of attack, it still resulted in a substantial amount of white lube all across the ground under the chain. 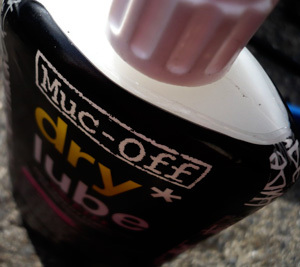 do not, whatever you do, lube the chain over the living room carpet, because when the other half returns from that shopping trip, somebody will be in deep sh*t.
in use, the muc-off dry lube is very effective, even after a morning pedalling in driving rain. i do find dry lubes make the chain sound a bit more clattery than those oil based lubricants, but i have faith that this is merely acoustics as opposed to inherent friction at source. while many of us take pride in a clean, shiny machine at the start of each ride, few have either the time, inclination or dedication to keep it looking that way. 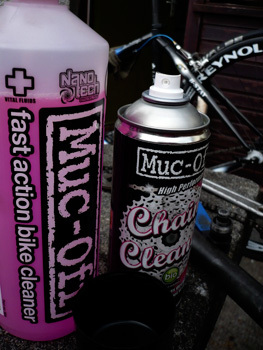 muc-off, for a price, have provided a more than equitable method of achieving exactly that. and with growing concern for the planet very much at heart, muc-off products contain no scary chemicals and are mostly bio-degradeable.